Last edited by reedak; 27-11-2018 at 03:22 AM. Woe betide anyone whom Trump claims as his “good friend”. Here I coin the term "Trumpian friendship" for such a bizarre "friendship" in which somebody touts you as his "good friend" on the one hand but stabs you in the back and front on the other. If you happen to be in the same boat with such a fellow as Trump in a storm, it is just a matter of time you will be thrown overboard. As well as mocking Pence's faith, Trump once sarcastically suggested he was his servant during a meeting in the Situation Room. Trump's former strategist Steve Bannon said that this was Trump's way of making “Pence know who's boss”. Such is the level of mockery by the President that one of Pence's friend's said she would not be surprised if Trump had nicknamed Pence “the deacon”. In conclusion, just check the long list of notable members of both the White House and the Trump administration at large who have left their posts. Last edited by reedak; 27-11-2018 at 03:24 AM. 1. The following are excerpts from the October 30, 2018 Reuters report headlined "Trump says he expects 'great deal' with China, but more tariffs if not". SHANGHAI (Reuters) - U.S. President Donald Trump said he thinks there will be “a great deal” with China on trade, but warned that he has billions of dollars worth of new tariffs ready to go if a deal isn’t possible. “And I have $267 billion waiting to go if we can’t make a deal,” Trump said. 2. Colin Campbell was the politics editor at Business Insider. Previously, he edited the politics section at The New York Observer and before that had his own site focused on Brooklyn politics. The following are excerpts from his November 19, 2015 article headlined "Donald Trump explains the give-and-take of deal-making like only he can". Real-estate tycoon Donald Trump has a decidedly Trump-like approach to the give-and-take of deal-making. “It’s give-and-take,” the Republican presidential front-runner told Business Insider. 3. Anyone who thinks he can make a "great deal” by using the deal-making tactics of the self-styled "Great Dealmaker" could lose the deal or even bankrupt his own company instead. “You gotta mostly take, “Trump claimed. However, the other party also gotta mostly take. Then what will be the outcome if both sides gotta mostly take? Such a "gotta be mostly take" or "take all" situation occurs between a wolf and a sheep, or between a robber and the robbed, or between a conqueror and the conquered. Trump's trade war tactics is a crude way of squeezing an opponent into submission. Long before the talks, he would pressure his opponent with all means, physically and psychologically, into submission. He thus creates a false impression to the outside world that his opponent is not entering into dialogue on an equal footing but is going to him to announce surrender. 4. For sinister intents that are not mentioned, the US launched a trade war against China. Its demands go far beyond the issue of trade deficits. When Trump says he expects a "great deal" with China, he means expecting the Chinese leader to yield to his demands. I suspect that Trump learned his crude deal-making tactics from his bitter experience with wealthy Saudis who bought his assets on the cheap as he veered time and again into bankruptcy. In 1991, Saudi Prince Alwaleed bin Talal purchased Trump’s yacht, Trump Princess, after Trump was forced to surrender it to creditors because he was roughly $900 million in debt. Talal’s purchase provided Trump “with desperately needed cash” at the time, according to Newsweek. In 1995, Trump’s lenders pressured him to sell the Plaza Hotel in New York City, which Talal purchased for $325 million, $65 million less than what Trump paid for it in 1988. In conclusion, I coin the term "Trumpian deal" for Trump's deal-making tactics which can be summed up thus: "Surrender, or else." Last edited by reedak; 27-11-2018 at 03:19 AM. 1. Donald Trump tweeted on 1 November 2018: "Just had a long and very good conversation with President Xi Jinping of China. We talked about many subjects, with a heavy emphasis on Trade. Those discussions are moving along nicely with meetings being scheduled at the G-20 in Argentina. Also had good discussion on North Korea!" 2. The following are excerpts from Paul Handley’s November 2, 2018 article headlined "US accuses China, Taiwan firms with stealing secrets from chip giant Micron". US Attorney General Jeff Sessions accused Beijing Thursday of backing a scheme by Chinese and Taiwan companies to steal an estimated $8.75 billion worth of trade secrets from semiconductor giant Micron. It said they conspired to rob US-based Micron's advanced designs to turn Fujian Jinhua into a major player in the global computer chip market. The indictment released in the US district court in San Jose, California alleges that three former Micron employees in Taiwan -- Stephen Chen Zhengkun, He Jianting and Kenny Wang Yungming -- joined UMC in 2015 and 2016 with the express plan to hand over to the company Micron's design and manufacturing processes for specific dynamic random access memory (DRAM) semiconductors. In recent years Washington has stepped up its fight against China's alleged ongoing economic espionage program against the United States, aiming to obtain all sorts of advanced technologies, from agriculture to heavy manufacturing. In the past two months the Justice Department has also indicted 12 Chinese, including three intelligence officials, in an alleged five-year plot to steal jet engine technology from major US and French companies who supply the world's airlines. "China is probably, over the long term, the biggest challenge, national security challenge that faces our country," Secretary of State Mike Pompeo said Wednesday in an interview with Fox News' Laura Ingraham. 3. As expressed in my newly coined terms "Trumpian friendship" and "Trumpian deal", Trump's double-faced strategy in the US-Sino trade war reveals his sinister intents towards China. Nobody can read the mind better than Malaysia’s 93-year-old Prime Minister Mahathir Mohamad who slammed the US leader more than once in public -- well, like the fatherly chastisements of a wayward son. He hit the nail on the head when he called US President Donald Trump “mercurial”, saying: "He changes his mind within 24 hours … When you have a man like that, you need to be cautious." Fortunately for Trump, the outspoken Malaysian politician is ruling a small country. If Mahathir is a leader of a big country like Saudi Arabia, Iran or Canada, Trump will have nightmares of being poked in the eyes every night! Speaking at a press conference on October 1, 2018 to announce a trade deal struck between the US, Mexico and Canada, Donald Trump claimed that India wanted to start trade talks with the US "IMMEDIATELY". But now ( November 6, 2018 ), more than one month after his wild claim, there is still no news of any trade talks between him and Modi or any trade deal struck between the two countries. Here I coin the term "Trumpian truth" to describe any wild claim, allegation, fabrication, lie, disinformation, fake news, half-truth, cover-up, etc invented by Donald Trump. P.S. How immediately is “immediately”? Last edited by reedak; 27-11-2018 at 03:27 AM. Despite voters signalling strong displeasure with his policies by voting the Democrats back into the House of Representatives for the first time in 8 years, Donald Trump tweeted on 6 November 2018: "Tremendous success tonight. Thank you to all!" To Donald Trump, everything is "Tremendous Success", even if he falls off his "big, beautiful wall" with a boom like Humpty Dumpty, or rather, Trumpty Drumpty. Here I coin the term "Trumpian success" to depict Trump's hyperbolic claim to “Tremendous Success” in everything concerned with him, even if it ends in dismal failure or serious setback. Please stop starting so many threads. Many of your posts would happily sit together in one of your Trump threads. Thank you so much for the advice. I would appreciate very much if you can help me put all my Trumpian threads into one thread entitled "Trumpian Series". Looking forward to your reply and help soon. 1. The following are excerpts from Business Insider's November 7, 2018 article headlined "A Nevada pimp who said he’s just like Trump won a state election even though he died 3 weeks ago". A pimp who was inspired by Donald Trump to get involved in politics has been elected to Nevada’s state assembly even though he died three weeks ago. Hof called himself “The Trump of Pahrump,” after his town in Nevada, and beat a three-term incumbent Republican in June’s primary. He told BuzzFeed in November that he thought support for him mirrored the continued support for Trump after the emergence of the “Access Hollywood” tape. 2. Dennis Hof often referred to himself as “the Trump of Pahrump,” a nickname that he said Roger Stone, an adviser to then-candidate Donald Trump and an early supporter of Hof, had come up with. Donald Trump is infamous for giving defamatory nicknames to others such as Little Marco, Crooked Hillary and Sloppy Stephen. The late brothel owner’s nickname was definitely not music to the ears of "blame king" Trump. Neither were Hof's apparent "flattering remarks". Last edited by reedak; 27-11-2018 at 03:29 AM. 1. 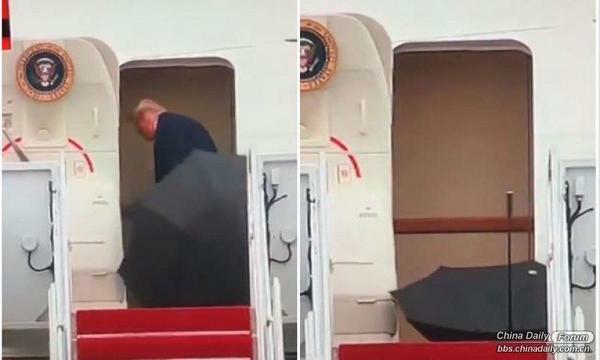 Instead of leaving the umbrella at the door, the person in the photo could have closed the umbrella and handed it to an attendant in the plane. Poor umbrella! It was left “shivering” in the cold long after the user had gone into the plane. (a) After helping to grow the business from a small shop to a multinational corporation, the co-founder was dumped like a Trumpian umbrella out of the company. (b) The tearful wife was left alone at home like a Trumpian umbrella while her unfaithful husband went on a long holiday trip with his newfound lover. (c) The homeless man sought shelter and food from his friend but forsook him like a Trumpian umbrella after winning the lottery jackpot. 2. By the way, please check the long list of Trumpian umbrellas or notable members who had left the Trump administration. I end this post with the touching story of the tragic fate of Boxer, a hardworking but naive and ignorant horse in George Orwell's Animal Farm. After losing its usefulness, Boxer became the Trumpian umbrella of the pigs. One day, Boxer’s strength fails; he collapses while pulling stone for the windmill. The other animals rush to tell Squealer, while Benjamin and Clover stay near their friend. The pigs announce that they will arrange to bring Boxer to a human hospital to recuperate, but when the cart arrives, Benjamin reads the writing on the cart’s sideboards and announces that Boxer is being sent to a glue maker to be slaughtered. The animals panic and begin crying out to Boxer that he must escape. They hear him kicking feebly inside the cart, but he is unable to get out. Soon Squealer announces that the doctors could not cure Boxer: he has died at the hospital. He claims to have been at the great horse’s side as he died and calls it the most moving sight he has ever seen—he says that Boxer died praising the glories of Animal Farm. Squealer denounces the false rumors that Boxer was taken to a glue factory, saying that the hospital had simply bought the cart from a glue maker and had failed to paint over the lettering. The animals heave a sigh of relief at this news, and when Napoleon gives a great speech in praise of Boxer, they feel completely soothed. Last edited by reedak; 27-11-2018 at 03:30 AM. Thank you very much for making this into a much more interesting combined/serial thread. 1. The following are excerpts from an article by Manoj Ladwa, the founder of India Inc. and chief executive of MLS Chase Group, posted on October 5th, 2018 under the headline "Trump’s ‘Tariff King’ jibe more bark than bite, we hope". It was only last week that US President Donald Trump praised India in glowing terms, calling it a free society of a billion-plus people that has successfully pulled millions out of poverty. A week later, India is the “tariff king” that imposes high import duties on US products and, having been caught out by a wise and sagacious White House occupant, now wants a trade deal. For I have no doubts in my mind that having publicly said, soon after cutting an agreement with Canada and Mexico, that India also wants a trade deal with the US only to please him, he has left himself little wiggle room to back out. But saner counsel should tell him in private that international trade deals are not negotiated at press conferences. The grandstanding by the US President and the discourteous braggadocio on display at the media briefing will only serve to undermine the drudge work being done over many months by the US Trade Representative’s office and the Government of India. Just consider this: Trump may have been scoring brownie points with his electorate at home but as the head of arguably the most powerful government in the world, shouldn’t he have considered how his statement would be received in India? Any trade deal will have to involve give and take from both sides. But with election fever hotting up in India, it will be extremely difficult for the Narendra Modi government – and, indeed, any other government in the given circumstances – to make even the slightest concession on trade without inviting strident charges of selling out. If anything, Trump has made it almost impossible for his trade team to proceed with the negotiations. I am convinced, as, I am sure, are most of you, that the US President is not overly bothered about such nuances. He has tasted blood – having got North Korea to the negotiating table and after forcing Canada and Mexico to renegotiate and replace the two-and-a-half decade-old North American Free Trade Agreement (NAFTA) with the very unimaginatively titled US-Mexico-Canada Agreement (USMCA) – and now wants more of the same from trade partners such as the European Union (EU), Japan and India. Trump is playing a very high stakes game of global poker by painting himself as some sort of iconoclast-bogeyman who has no respect for set international norms and rules, or even agreements signed by his predecessors. Never mind that this is cutting the ground from under the very edifice that the US had helped design and maintain since the end of the Second World War, which has brought it and several other countries unprecedented prosperity and global influence. But despite his own falling global standing and the US’ diminishing global prestige thanks to his antics, Trump has shown a single-minded devotion to not straying from the line he has drawn on the ground. After blowing hot and blowing cold on India till now, he seems to have set his sights on what he considers a fair trade agreement with New Delhi. So, the Modi government will have to be prepared for unilateral punitive, or at the very least, additional tariffs on Indian exports as well as other restrictions for Indian goods and services entering the US market. (a) Something you say that means people should not criticize someone else for a fault that they have themselves. (b) A situation in which one person criticizes another for a fault the first person also has. 3. Here I coin its modern version: "The Tariff Emperor calling India a tariff king." (a) Don't scold me for being late. You were late for work yesterday. That's the Tariff Emperor calling India a tariff king! (b) The two politicians sling mud at each other during their election campaigns. It’s like the Tariff Emperor calling India a tariff king. Last edited by reedak; 27-11-2018 at 03:31 AM. 1. The following are excerpts from an article by Dave Gilson, a senior editor at Mother Jones, posted on November 10, 2018 under the headline "As California Burns, Trump Threatens to Cut Federal Funding" and subheading "The president is tweeting nonsense about wildfires — again". So far, the president has not mentioned another major factor behind California’s wildfires: climate change. Climate change is making fires worse, and it is expected to make them more frequent. Even Trump’s own Forest Service acknowledges this (without using the dread phrase “climate change”). And like several earlier California fires, the Camp Fire may have been sparked by a power line. 2. The meaning of the phrase "Fiddling while Rome burns" is "to occupy oneself with unimportant matters and neglect priorities during a crisis". Here I coin a modern version of the idiom: "Tweeting while California burns." Last edited by reedak; 27-11-2018 at 03:32 AM. 1. Tsvetana Paraskova is a writer for the US-based Divergente LLC consulting firm with over a decade of experience writing for news outlets such as iNVEZZ and SeeNews. The following are excerpts from Tsvetana Paraskova's November 14, 2018 article headlined "India Ready To Import More U.S. Oil And Gas". India is ready to import more crude oil and liquefied natural gas (LNG) from the United States to expand bilateral trade, India’s Foreign Secretary Vijay Gokhale said on Wednesday. (a) To waste money on a project that can be accomplished cheaply by other means, that is, to do something at an unnecessary cost. (b) To take something to a place where its kind can be obtained more cheaply elsewhere. (a) Don't pester me to buy your kitchenware. I am not so stupid as to carry American oil to India since I can buy the same kitchenware more cheaply from my friend's shop. (b) You have been carrying American oil to India by getting that unscrupulous contractor to renovate your house. If you have approached me earlier for the renovation, you would have saved a lot of money. (c) To waste money buying ready-cooked meals would be like carrying American oil to India. Hence I prefer to cook my own meals or eat at my mother-in-law’s house every day. Last edited by reedak; 27-11-2018 at 03:34 AM.